Let me just be blunt. I am in the doily camp. I love a good hat on Shabbos but I simply don't own any decent ones. I rarely wear scarves at shul on Shabbos, mainly because all of mine are pretty casual and I still don't really know how to match them to my outfits. Yes, I really am a fashion disaster. 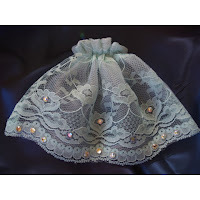 That leaves the head covering options to Kippah and Doily. It isn't that I don't like kippot on women. For me, it is just not a fit. I have never worn one and have never had the desire, either. I have always worn doilies (yes, I blame Rachael for this!) I was forced to wear a kippah the other day at a shiva minyan, basically because I forgot to bring something else with me (scarf) and those were the only available head coverings. Since I do feel strongly about covering my head when davening, I did feel that I should have something on. However, I felt so awkward with a kippah. It almost felt sacrilegious. I am just not used to it. And now, Kimber-style, time to self-analyze. I wonder why I had such a strong reaction to wearing a kippah. After all, many of my female friends wear them at shul and a few wear them all the time. I don't have a negative reaction to a kippah on them at all. Why would it affect me to the point of feeling uncomfortable? 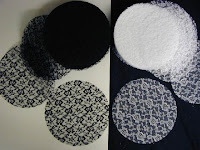 Regardless, it is back to Doilies for me. 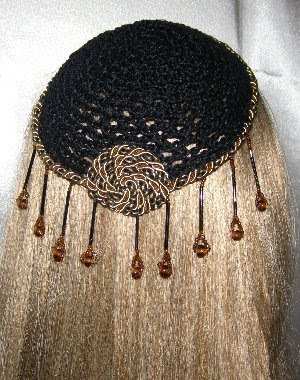 Side note: I did see this kippah online and think that it looks really nice! PS - sorry I made you paranoid. in some circles kippah's only connect the men AND even among conservative jews, men are more likely than women to wear them outside of shule AND reform jews don't usually wear them at all so, Kippah, kippah's don't necessarily connect ALL jewish people. However, Doilies/head coverings and hats do connect most female jews. However, I do see your point. Kippah use when performing a mitzvah, or commandment and its a tradition. Im a Kippah lover actually.